What can Christianity do in a society? Or perhaps, what does it look like when Christianity fuels a movement for change? 50 years ago today, a 34-year-old Dr. Martin Luther King III gave the very familiar ‘I Have A Dream’ speech in Washington. The language will be familiar to any christian. The use of biblical metaphors he used to pepper every sentence are no different from the ‘rev’ that gets Pentecostals to whoop across various churches every Sunday. The man was simply on a pulpit delivering a powerful moral sermon. Which Christian is not familiar with ‘justice rolling down like the waters and righteousness like a mighty stream’? 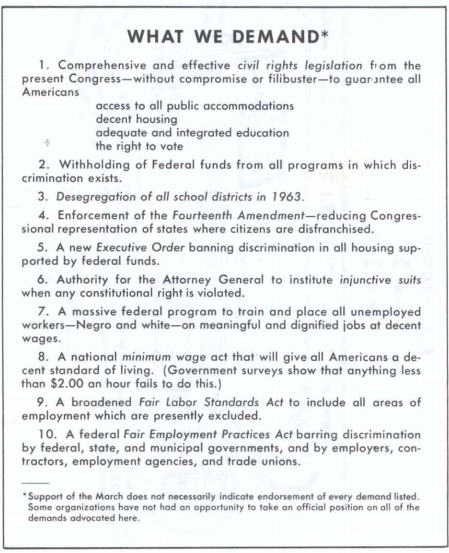 Of those 10 points, at least 7 are clearly and explicitly economic demands. Perhaps you might demand different things today with hindsight (indeed Dr King himself later somewhat backed away from point 8) but Dr. King understood that a life of poverty is a life of NO…everything you need or want, the answer is NO. Like many people, I used to be a better Christian than I am these days. Lately there has been a lot of online chatter about the senior Pastor of COZA, Abuja and his dalliance with Miss Ese Walter. You get the sense that even when Nigerians are unable to articulate what they think the church should be doing, there is a larger consensus on what it should not be doing. Here are a couple of articles by Tolu Ogunlesi and Wole Olabanji that state the case for what the church should not be doing. No doubt the problems we face today in Nigeria are different from the raw segregation and dehumanizing conditions that blacks faced in Dr. King’s 1963. But do we no longer need jobs? Or houses? Whereas Dr. King led hundreds of thousands of people to speak truth to power, these days people line up to go and listen to superstar preachers sedate them with platitudes and promises of divine riches that somehow bypass the reality of the economics in which they live their daily lives i.e. the economy might be very bad but your job is to divinely rise above it or in some cases have another person’s wealth divinely transferred to you. Where the bible is studied, too often it is used as something to separate those who ‘understand’ from those who don’t comprehend the mysteries therein creating a client class of adherents who will always need something to be ‘explained’ to them, often for a fee. Dr. King used biblical metaphors to ask for jobs and housing. He used his Christianity to prick America’s conscience into action. In other words, there is nothing in Christianity that is incompatible with economic development for Christians and everyone in general. This blog post is rather pointless I suppose but it is useful to know, 50 years later, that Christianity is not simply a pain reliever or anesthetic to numb adherents from the pain that is all too real around them. You can powerfully use biblical metaphors and verses to prick the conscience of our leaders in a way that will hasten them to provide stable electricity and accommodation for Christians and Muslims alike, not forgetting the Ifa Massive too. Dear friends, I have read the CBN’s guidelines for the new N200bn fund to kickstart MSMEs in Nigeria (N220bn actually but I will come to the extra N20bn shortly). I read it so that you don’t have to as I know how busy you all are. I think this will work better with bullet points so here are the highlights I managed to extract from the document. 1. In total the fund is N220bn but N20bn of that is not for lending per se. N11bn will be for grants; think of it like a mini YouWin. As part of the whole infrastructure of disbursing the funds, CBN will appoint ‘managing agents’ to stand like a bridge between CBN (the money) and the banks. Presumably this is to ensure it doesn’t go the way of former SME funds. So the managing agents will get N4.4bn out of this money to fund their operations. 2. So we are left with the N200bn. Of this amount, 60% or N119bn will go to women entrepreneurs. Yes, women. Men will get N79bn. 5. The CBN’s definition of women owned enterprises is a bit confusing, at least to me. It simply states that the business must be at least 75% owned by ‘female Nigerians’. Given that the criteria for Microenterprises is sole proprietorship, I am not sure if the CBN is deliberately inserting a loophole to make it easier for women to get past the patriarchy of Nigerian society. Which is fine if it is. Otherwise it might just create more unintended confusion. 6. Perhaps unlike previous funds, this particular iteration will not be disbursed by banks only. The funds will be available through regular banks, microfinance banks, Cooperatives and even NGOs (most likely for the grant portion) as long as they qualify and are approved by the CBN as PFIs – Participating Financial Institutions. I think this is important because for those who get easily annoyed by the banks, at least you now have options. Note however that the maximum amount to be obtained from each type of institution will be different. A Microfinance Bank with only one branch can lend out a maximum of N10m. If you need N20m, don’t go to such an MFB. An MFB with branches across a state can lend out a maximum of N50m. An MFB with national presence can lend out a maximum of N1bn. Knowing this might save you some time-wasting trips. Cooperatives and NGOs can do a maximum of N5m. Update: A friend brought the above point to my attention and I have read the document again. MFBs are not allowed to lend more than N500k to a single customer. So those numbers I quoted above are actually the amounts CBN will lend to the PFIs at a time. In the case of a single branch MFB, CBN will lend it N10m which means it can lend that amount out to 20 different customers at a max of N500k each. So if you need more than a N500k loan, you won’t be able to get this from an MFB, you will have to go to a bank. Apologies, the error was all mine. 7. What kind of businesses will qualify to get money from this scheme? Pretty much any kind of business from manufacturing to service businesses. However only 10% of the fund will be for ‘trading and commerce’ type businesses. So for example, if your business is buying baby clothes from London and selling in Nigeria, your chances of getting money from this fund are 1 in 10. However if you decide to start making ankara baby clothes in Nigeria, then your chances are 9 in 10. This is a rough example but you get the gist – the CBN has set up the fund with a bias for more productive stuff as opposed to ‘my container is on the high sea’ type of businesses. No disrespect to the hustle of traders which is by no means an easy thing to do. 8. The CBN will lend the money to the PFIs at an interest rate of 9% per annum. However there will be a cap on the amount of extra interest they can charge of 6%. I suspect that the CBN is hoping that competition will prevent the PFIs of charging the maximum 6% bringing the total to 15%. Sadly, I wish the CBN did it better because it’s almost guaranteed the PFIs will all charge the maximum 15% and competition wont bring down the interest rates. Compared to what we have today, 15% is perhaps a decent improvement but I would have loved for the CBN to keep the rates in single digits if only for psychological reasons. Having said that, the CBN has added some bonus ‘prizes’ for PFIs who stay under the 15% interest rate mark. The lower the interest rate they charge, the bigger the ‘prize’ they get starting from bronze all the way to platinum. They also get prizes for the speed with which they approve loans from 4 weeks to 1 week. Let’s hope these incentives sufficiently ginger them. The maximum tenor of the loans will be 3 years. Combining these two – tenor and interest rates – we can work a rough example. If you borrow N5m and you get charged the maximum 15% per annum over 3 years, you will pay back around N173k per month for 36 months. At the end of the loan, you would have repaid N6.2m. But…. 9. The CBN has added something called an Interest Drawback Programme (IDP) into the mix. If you make all your repayments on time and pay off the whole loan as agreed at the beginning, you will be entitled to a refund/rebate of 40% of the interest you paid. So from our example above, the amount of interest paid was N1.2m on the original N5m loan. This means that if you made all your payments on time, you will be entitled to a refund of N495k. Again, using rough calculations, if you get that refund for being a good borrower, it means you actually paid 9.25% as interest instead of the original 15%. The PFI will have to apply for this rebate for you though as it’s not automatic. Once the application is made on your behalf and the CBN approves, the money will then be refunded to you. Note that: If your loan tenor is for longer than one year, you will be due for the IDP refund quarterly. So you can be good for 2 quarters and you will get the refund. If you subsequently then behave naughty, you wont get any refund for that quarter. If your loan is for a tenor of 1 year or less, then you only get the IDP at the end of the loan not quarterly. Sorry if this is confusing, drop a line in the comments if its unclear. Based on this, it’s safe to say its down to any good borrower to chase this up themselves and keep all necessary records. I doubt the PFIs will have a lot of incentives to voluntarily do this for their customers. 10. The guidelines don’t say much about borrowers but the CBN has been making all the right noises about this lately. So its safe to say, you wont be asked to bring your mother’s stool sample as collateral. All the papers carried reports of CBN trying to bring in moveable assets as acceptable collateral for lending. So say you are a photographer and you need credit to buy more equipment, your existing camera will now be taken into consideration as collateral. Note that this announcement today is separate from the MSME fund that was launched last week but I see no reason why we shouldnt have a joined up process. Here’s the bottom line – we are slowly but perhaps surely getting to the point where lack of funds becomes less and less of an excuse for entrepreneurs. There is some money out there even if not a massive amount. What’s left now is serious entrepreneurs who can borrow and repay the money (so it can be lent to someone else and so on). It’s time to polish up your ideas and make them fundable. Between the CBN and the BoI and even nascent Venture Capitalists like Spark, there is some money out there to back entrepreneurs that wasnt there say 5 or 10 years ago. But what I keep hearing from people who actually have to disburse the money is that a lot of entrepreneurs are simply not fundable. Ask for help if you are struggling to make a loan application. There are people out there who will be willing to help you look through an application and put it together properly. Because when you do it yourself and you get turned down, you already have an excuse to fall back on and there is nothing more discouraging and self-defeating like a ready excuse. So give yourself the best chance. Because the money is coming from the CBN doesn’t mean it will be thrown in the air like confetti – the difference between you and someone who gets funded will almost certainly be preparation and nothing to do with the strength of your ideas. Finally, expect the process to be painful. I have heard ‘testimonies’ from people who got BoI funding. It is a very painful process but they absolutely got there in the end and as difficult as it was, they all say the BoI has some useful people who know what they are doing. No doubt there are enemies of progress out there who will refuse applications for no other reason than the fact that it excites them, but let’s hope they are outnumbered this time around.